Two summers ago, I made a huge discovery. Something biologists, botanists, teachers, plant experts, grandmothers, and five year old children have known all along. 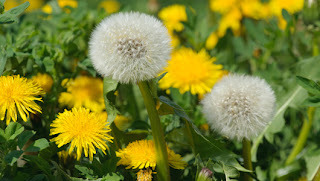 The yellow dandelions are the same as the blowy dandelions. How do I go throughout life...aware, alert, engaged, and let's face it, basically a genius, without recognizing this? But for the 20 (that is a stretch) of you that read my blog, I wanted to make sure that this doesn't happen to you. My friends have told me something along the lines of: "don't bother. everyone knows they are both dandelions and you will just embarrass yourself." I am telling you anyway! I also just realized anyways isn't a word. Please erase all instances of it on this blog pre-right now. If I ever thought about it, I would know it was not a word. I blame my use of it on my little sister who, in her early teens, would respond to my questions with "anyways." Like that was the only word in the response. Such baditude! Example: "hey cindy, how's your boyfriend? can i meet him? what is his favorite color?" gets the response, "anyways..."
So when I got dandelion greens in my CSA this past week, I was haunted by these dandelion memories. I want to write more about my CSA later. Early summer (or "spring" as some people call it) brings lots of greens. I saw someone on FB post what they got in their CSA box and it incuded tomatoes, red peppers, fruit, a head of lettuce wrapped in plastic, and a lot more. Well. Ok. They must live in magic land. But whatever, if getting a box of surprise produce gets you cooking and eating veggies...I guess I don't really care where it comes from. Mine comes from about 15 minutes away and IT IS THE CUTEST FARM EVER. I cooked up all the greens I got in various ways. I will try to post what I did with our huge box of greens. 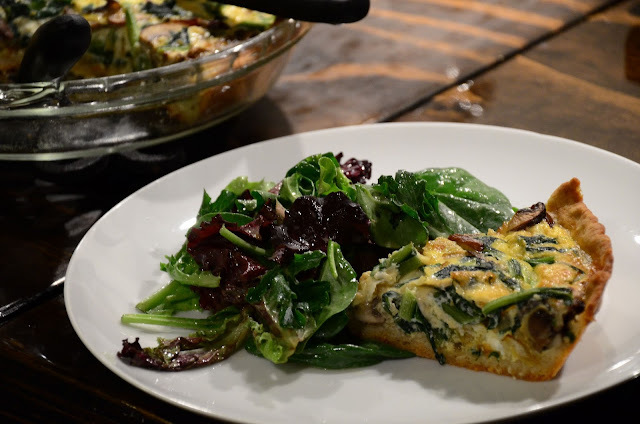 But if you have any dark greens to eat up, try making a tart (or even a frittata if you want something quicker). This tart is a whole wheat, olive oil, yeasted crust. Considering I don't make tarts often, I can't really provide any proof that this was delicious. I believe most tarts are made with butter, white flour, and no yeast. The dough was extremely easy to work with. I just mixed with a wooden spoon, kneaded a few times by hand, let it rise for an hour, and shoved it into a pie pan (I don't have a tart pan). 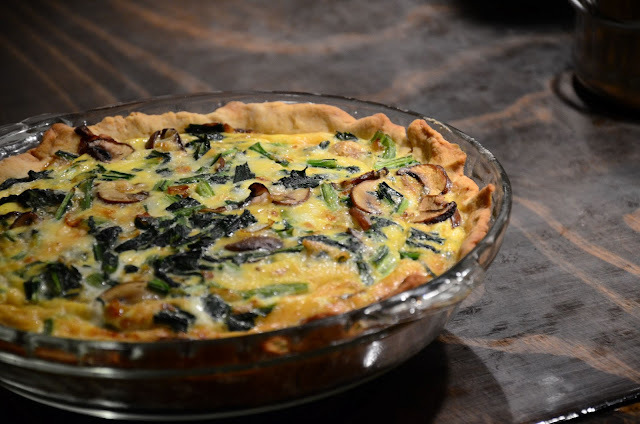 The inside of the tart is filled with a big bunch of blanched dandelion greens, mushrooms, Gruyere cheese, milk, and eggs. I like that the whole tart only has 3 eggs, rather than a frittata which might have 9 or so. There are a lot more veggies and then the crust is more substance. I love to serve things like this with a green salad (dressed with a mustardy vinaigrette). You can use up your salad greens too! 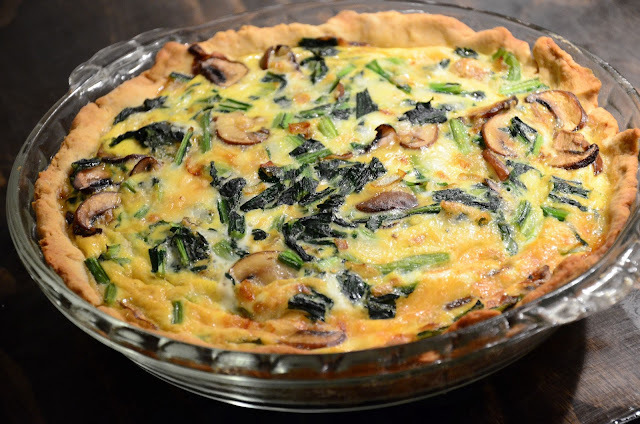 Thanks to my local Sporthill Farm CSA for sharing this recipe with us! Preheat the oven to 375 degrees. Heat the olive oil in a large nonstick skillet over medium heat, and add the onion. Cook, stirring, until tender, about five minutes, and add a pinch of salt and the mushrooms. Cook, stirring, for four to five minutes, until the mushrooms have softened and the onions are golden. Add the garlic and cook for another minute, then stir in the dandelion greens. Stir together for a minute, and remove from the heat. Season to taste with salt and pepper. Yeasted crusts are more rustic than French-style short crusts. They’re also easier to manipulate — they don’t crack and tear. Remember to roll this out thinly so that it doesn’t become too bready. Dissolve the yeast in the water, add the sugar, and allow to sit until the mixture is creamy, about five minutes. Beat in the egg and the olive oil. Combine the flours and salt, and stir into the yeast mixture. You can use a bowl and wooden spoon for this, or a mixer — combine the ingredients using the paddle. Work the dough until it comes together in a coherent mass, adding flour as necessary. Turn out onto a lightly floured surface, and knead gently for a few minutes, adding flour as necessary, just until the dough is smooth — do not overwork it. Shape into a ball. Place in a lightly oiled bowl, cover the dough tightly with plastic wrap, and allow to rise in a draft-free spot until doubled in size, about one hour. Turn the dough out onto a lightly floured surface, gently knead a couple of times, and cut into two equal pieces (or as directed in each of this week’s recipes). Shape each piece into a ball without kneading it. Cover the dough loosely with plastic wrap, and let rest for five minutes. Then roll out into thin rounds, as directed in each recipe, and line pans. If not using right away, freeze the dough to prevent it from rising and becoming too bready. The dough can be transferred directly from the freezer to the oven. I totally forgot about your dandelion revelation! I'm so glad that came back into my life.